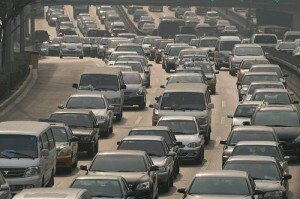 The city of Beijing, China has recently announced that it will severely limit the number of new vehicle registrations, in an effort to curb traffic gridlock and improve air quality in the city. License plates are to be allocated to citizens under a license plate lottery system. The new restrictions will limit the number of 2011 vehicle registrations to 240,000. That’s a significant decrease from the massive figure of 700,000 in 2010. There are nearly 5 million vehicles already on Beijing roads. China recently outpaced the United States as the world’s biggest selling motor vehicle market. China’s huge population and growing affluence have led to large numbers of new cars and significant traffic problems in many Chinese cities. The new system seems like it will have a pretty good chance of working – after all, no means no. Could you imagine a similar system being implemented in the United States, ever?